Cellulite is the term for the lumpy, dimpled flesh found mostly on the thighs and buttocks, but also can be present over any area of fat. Roughly 90% of women and 10% of men have cellulite and despite the miraculous results hyped by cream and device manufacturers, there is no permanent cure. Thankfully, there are treatments that can provide temporary improvement, and without needles, pain or downtime. To understand how cellulite treatments provide results, it helps to know the architecture of the skin and fat. 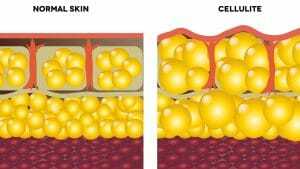 Fibrous septae (the red vertical lines in the diagrams) are tough membranes connecting the skin to deeper tissues, compartmentalizing the fat cells contained between them. Due to multiple factors including hormone effects, increasing fat cell size, decreased circulation, and decreasing skin thickness and elasticity, the fat in areas of cellulite bulges outwards, with dimpling resulting where the septae are attached. The tethering effect of the septae is what causes cellulite's dimpling to be most visible with gravity, such as standing. Knowing how the architecture produces the hills and valleys seen with cellulite, makes it easier to understand how cellulite treatments that tighten the skin and/or reduce the size of the fat cells can produce a smoother appearance. Skinspirations offers a combination treatment for cellulite consisting of radiofrequency skin tightening and ultrasonic cavitation fat reduction, that can provide modest results with a series of treatments, without needles, scars, pain or downtime. The best candidates for this treatment are those with a normal body weight and mild cellulite. When there's excess fat present, CoolSculpting or Injection Lipolysis may be better treatment options. A series of at least six treatment sessions are recommended initially, with maintenance treatments as needed. The price for a series of six treatments to the thighs and buttocks is $840, which is 20% less than if the treatments are purchased individually. Let our body contouring experts at Skinspirations help you decide what the best treatment option is for you by calling 727.571.1923, for your complimentary consultation.